I always make a cake for my family's Easter celebration (one year it was in the shape of a bunny ... sometimes I get carried away). With the holiday quickly approaching, I can't decide which spring favorite to bake, so I thought I'd make several options in the weeks leading up to Easter to help decide. First, the Carrot Cake. This recipe has been in my family forever. I used to make it so often that I think everyone got tired of it. Pulling out the recipe, I couldn't believe I hadn't made it in several years. It's back, and it's just as good as I had remembered. It is incredibly moist (I know, I hate that word too but there is just no better way to describe it), a little bit spicy (cinnamon) and topped with the sweetest cream cheese frosting ever. I like to add pecans not only because they look pretty but because they add a crunch I like in every bite. This cake is great for Easter and Thanksgiving, it makes for a unique birthday cake and is amazing for breakfast. 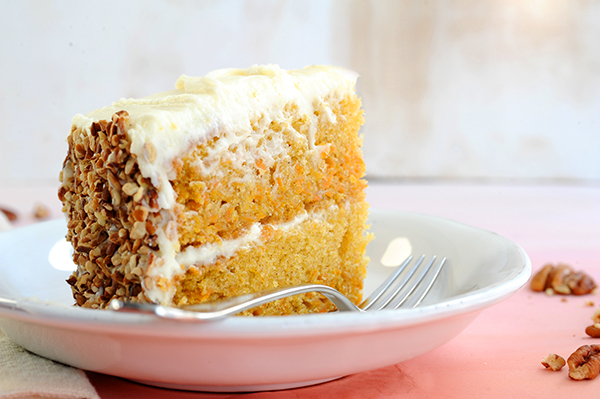 The secret to the perfection of this cake is the grated baby carrots. This is important ... I know you can buy grated carrots at the grocery but DON'T. Buy BABY CARROTS and grate them at home. I know it's a mess and a hassle but it's totally worth it. The baby carrots are sweeter and have a higher water content. They make this cake moist without making it dense. So, get out the food processor, push the pulse button and grate away. You'll be glad you did. I think I could eat cream cheese frosting on just about anything. It goes perfectly on this cake and there is always just enough left in the bottom of the bowl for a little afternoon treat. You're welcome. 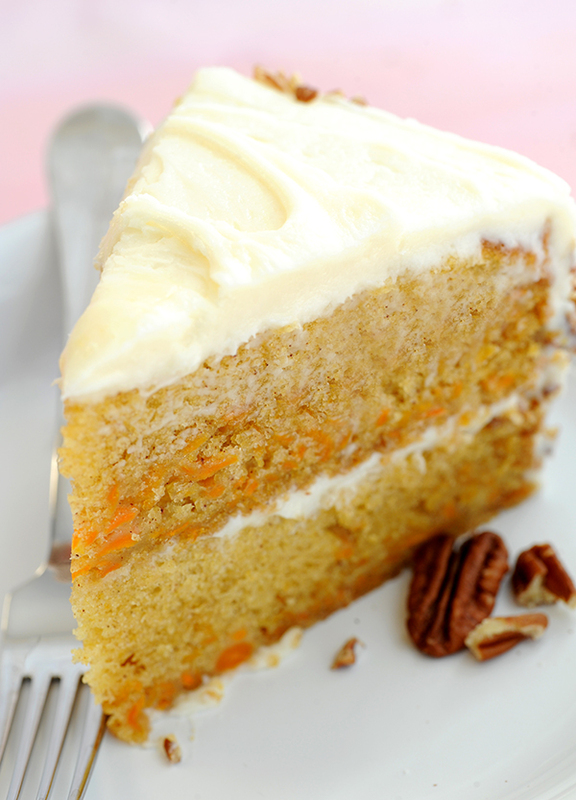 From our family to yours, our carrot cake recipe. May it also become one of your favorite traditions. Combine flour, sugar, baking soda, baking powder, salt and cinnamon in the bowl or an electric mixer and mix well. Add the oil and egg and beat on low speed until the dry ingredients are moistened. Add the carrots and increase to medium speed for 2 minutes. Pour into 2 greased and lightly floured 8-inch round pans. Bake for 40 minutes or until a toothpick placed in the center of the cake comes out clean. Cool in the cake pans for 10 minutes and then remove to wire racks to cool completely. Spread with Cream Cheese Frosting between the layers and over the top and side of the cake. Place chopped pecans on side and top of cake if desired. Beat cream cheese, butter and vanilla in the bowl of an electric mixer until light and fluffy. Add the confections' sugar, beating until smooth.